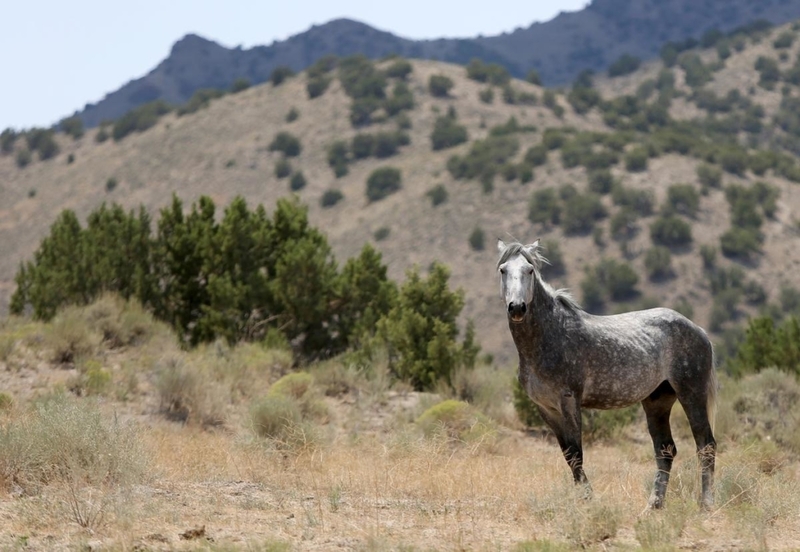 A wild horse photographed at the Cedar Mountain Herd Management Area in Utah. Deseret News file photo. Interior Secretary Ryan Zinke has appointed Utah Republican Rep. Chris Stewart’s former chief of staff as the new acting director of the Bureau of Land Management — the latest move in an ongoing, monthslong Interior Department reorganization effort. Brian Steed, who last month was appointed BLM’s deputy director of programs and policy — the agency’s top political appointment — will now lead the agency’s more than 9,000 employees who oversee about 245 million acres of public lands. Steed replaces Mike Nedd, a career BLM employee who since March has served as the agency’s acting director. President Trump has yet to nominate a permanent BLM director. Nedd sent an email to BLM staff late yesterday announcing the changes. In the email, Nedd also said he will move to the post of acting deputy director of operations, which handles the day-to-day operations of the agency and its employees. John Ruhs, who has served as acting deputy director of operations since May, will return to Nevada, where he was formerly BLM state director. The moves involving Nedd and Ruhs will be carried out “in the coming weeks,” Nedd wrote in his email. Steed’s appointment is effective immediately, an agency spokesman confirmed. One BLM official said Steed “made a positive impression” on employees at a recent meeting. “My sense is that he’ll be very popular at BLM and it’s a good fit,” added a former senior BLM official, who also asked not to be identified. But others expressed concerns about Steed’s position as a political appointee and his connection to Utah and its Republican-led congressional delegation. Steed served as Stewart’s chief of staff from 2013 to last month. Prior to that, Steed served as the congressman’s campaign manager, according to his LinkedIn profile. His appointment comes as Zinke has recommended that Trump reduce the size of the Grand Staircase-Escalante and Bears Ears national monuments in Utah. Grand Staircase-Escalante is managed by BLM, and Bears Ears is overseen by BLM and the Forest Service. Both recommendations have been sharply criticized by conservation groups and congressional Democrats. But Stewart and other members of Utah’s congressional delegation have been vocal critics of those national monument designations by Presidents Clinton and Obama, respectively. “He obviously has connections to the Stewart Utah mafia, with tentacles extending throughout Utah politics,” one former BLM official said. Kate Kelly, the public lands director for the Center for American Progress, said Steed’s appointment to acting BLM director is troubling. “Steed is one of several former Utah delegation staffers that now serve in key positions at the Interior Department and White House,” said Kelly, a former senior adviser to Obama’s Interior Secretary Sally Jewell. Steed has extensive government and legal experience. He taught economics at Utah State University’s Jon M. Huntsman School of Business, as well as political science at the university. He served as deputy county attorney in Iron County, Utah, from May 2003 to August 2005, according to the LinkedIn profile. He earned a doctorate in public policy from Indiana University, Bloomington, in 2010 and a law degree from the University of Utah in 2002. Steed’s promotion comes at a time when the agency is undergoing major changes. Zinke has said he wants to reorganize Interior, perhaps even moving BLM’s headquarters out of Washington, possibly to Denver (Greenwire, Aug. 15). The ongoing reorganization effort has already resulted in the removal of three BLM state directors in Alaska, Colorado and New Mexico (Greenwire, June 27). Ruhs’ return to Nevada was rumored among BLM sources for some time. Ruhs is credited as state director with helping defuse tensions between the agency and Nevada ranchers following the Cliven Bundy standoff three years ago. “I appreciate John’s sacrifice over the past seven months while he has lived away from his family and the wide open spaces that he loves,” Nedd wrote in the email to staff. Ruhs’ move back to Nevada will also reduce the number of acting state directors. Nevada is one of six state offices with no permanent BLM state office director. The others are the Alaska, Colorado, Montana-Dakotas and New Mexico offices and the Eastern States office, which includes 31 states east of and bordering the Mississippi River.